The Bersimis-1 plant’s outflow canal feeds into the Betsiamites River below a mountain 50 miles north of the St. Lawrence River. BAIE-COMEAU, Québec — Deep beneath a granite mountain in the vast, snow-covered wilds north of the Saint Lawrence River, a frigid torrent surges through a massive, man-made tunnel, its white water propelling eight powerful turbines that generate electricity for hundreds of thousands of people. “Hydro-Québec categorically refutes the allegations of the Innu of Pessamit, who claim that increasing our exports will adversely affect [their rivers],” said Lynn St-Laurent, a spokeswoman for the company. “All proposals are evaluated for their environmental impacts, including the extent to which a project demonstrates that it avoids or mitigates, to the maximum extent practicable, impacts to natural resources,” said Peter Lorenz, a spokesman for the state Executive Office of Energy and Environ-mental Affairs. “Ultimately, permitting decisions are up to the local governing authorities,” he added. 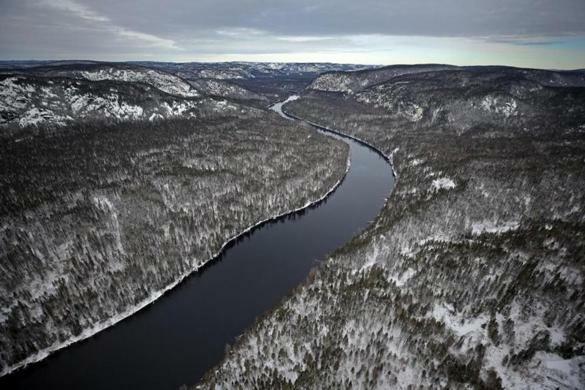 At the heart of the conflict between the Pessamit and Hydro-Québec is the health of the Betsiamites River, an important spawning area for salmon. For thousands of years, the Pessamit have used special nets to catch the migratory fish, which have been vital to their diet and central to their culture. The meandering, cliff-lined river, however, is now the site of two major hydropower plants, including the first one built by Hydro-Québec. That plant, known as Bersimis-1, is a marvel of 1950s engineering. It features two enormous dams that flooded a vast, wooded area to create a 290-square-mile reservoir, which feeds the stored water into a 7.5-mile underground tunnel and stirs eight turbines built beneath a nearby mountain. 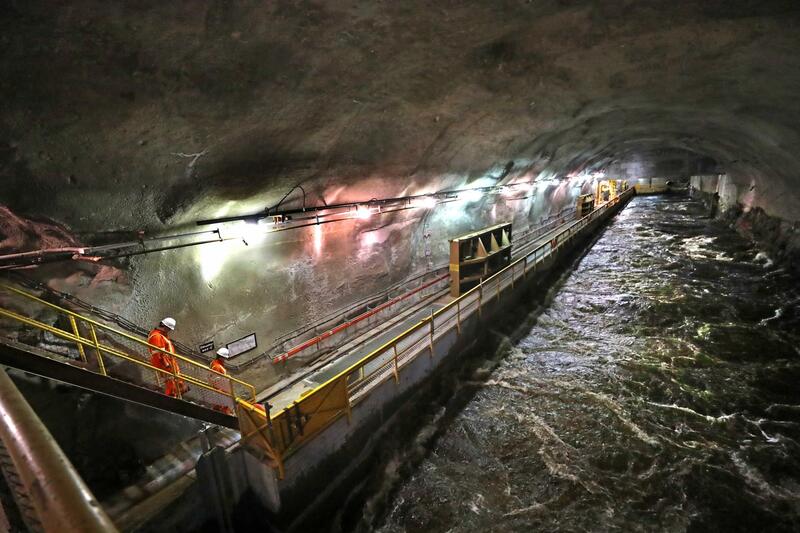 At least twice a day, as millions of Québécois awake in the morning and return home in the evening, plant operators cater to spikes in electricity demand by altering the flow of water into the river. Such changes raise and lower the river by about 5 feet, an unnatural process that has had a significant ecological impact on the Betsiamites. “There is no salmon habitat in the world subject to such water-level variation,” said Louis Archambault, a political consultant representing the Pessamit in negotiations with Hydro-Québec. As a result, he and others said, the river’s clay banks have steadily eroded, spreading a fine silt that has destroyed many spawning grounds. Faster currents have also washed away salmon nests, while low river levels have dried up others, they said. In the 1940s, before the dams were built, the Pessamit say they regularly caught about 1,200 salmon a year. Last year, they caught just 56. Since 1992, they have caught an average of 170 a year, the Pessamit say. Members of the Pessamit community talked about the river, dams, and the power company. “We’re very concerned for the future of salmon,” said Andre Cote, a biologist for the Pessamit, who have about 4,000 members left in the region. While the dams have made the Betsiamites less welcoming to salmon, which migrate between the sea and the river, there are other reasons for their decline. Overfishing has been such a significant problem that the Canadian government banned commercial fishing for salmon in 2000. The recreational catch and fishing by indigenous groups, such as the Pessamit, have also contributed to the problem. Warming waters related to climate change have also been identified as a threat to the region’s salmon, which have been listed as a species of “special concern” by Fisheries and Oceans Canada, a federal agency. Over the past three generations of salmon that inhabit the waters near Baie-Comeau, the population has declined by about a quarter. 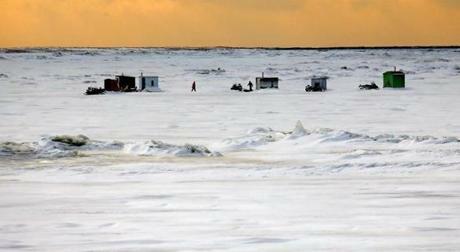 Power plants on Quebec’s rivers can clash with native ways of life, such as ice fishing on the Outardes River. Officials at Hydro-Québec also note that they spent millions of dollars between 1999 and 2010 working with the Pessamit on a salmon restoration project. During that time, the number of large salmon returning to the Betsiamites more than doubled, they said. “A committee of independent experts recognized that the program enabled significantly higher salmon returns and underscored how important it was for the community of Pessamit to follow a fishing plan to ensure the long-term maintenance of a salmon population in the river,” St-Laurent said. 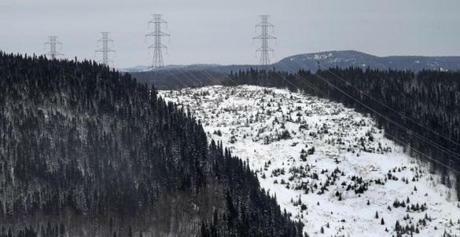 While Pessamit officials found the results of the restoration project “encouraging,” they felt abandoned after Hydro-Québec shuttered the program. The company is now blaming the victims, they say. The Pessamit now worry that greater exports of hydropower to New England could further endanger the river. The plants on the Betsiamites, they note, are among only a few in Hydro-Québec’s system that can provide additional power when there’s greater demand, especially during cold spells or heat waves. They fear that the company will rely on those plants more often to accommodate the energy needs of Massachusetts, requiring operators to raise and lower the river levels more frequently. They also worry that the company will increase water levels in its reservoirs, making the rugged, often ice-encrusted lands where they hunt caribou and trap beavers more vulnerable to flooding. There’s reason for their concern. In October, during a heavy rainstorm, Hydro-Québec released an unprecedented amount of water from the reservoirs that feed into the Betsiamites, which the Pessamit say damaged salmon spawning grounds and flooded six of their traditional camps. 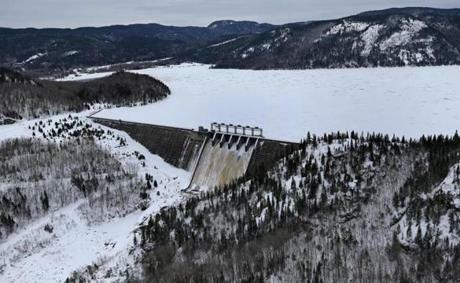 They accused the company of endangering their people by overfilling the reservoirs, arguing that they did it to demonstrate that Hydro-Québec has more than enough capacity to comply with Massachusetts’s requirements. The reservoirs should have been prepared to cope with such a storm, especially given the relatively little rain earlier in the year, they said. Hydro-Québec officials insist that they already have a surplus of energy and that there would be no reason to rely exclusively on the plants along the Betsiamites or change water levels more frequently. The energy sent to Massachusetts could come from anywhere on their grid, they said. Pylone power lines cut through the mountains and forest from the hydroelectric power stations. They also challenge the allegation that they overfilled their reservoirs, which they said were at typical levels for that time of year. The reason they had to be drained quickly was because the region received nearly six times more rainfall than usual for late October, when the region typically gets snow instead of rain. Over the coming weeks, negotiators from Hydro-Québec and the Pessamit are scheduled to discuss a range of other issues, including historical grievances that led the tribe to file a $500 million lawsuit against the company, province, and federal government. The Pessamit have long felt ignored, especially while other indigenous groups have reached substantial financial settlements with the government. In interviews with the tribe’s elders in front of a senior official from Hydro-Québec, the Pessamit explained their sense of loss and how their lives, and their children’s lives, have changed irrevocably. 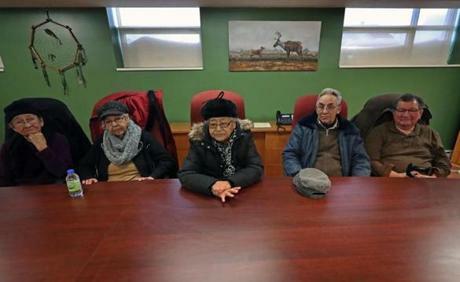 Daniel Lauzon, the director of aboriginal affairs and lead negotiator for Hydro-Québec, heard the elders’ stories and said he hoped they could find common ground. But many of the Pessamit remain unconvinced. 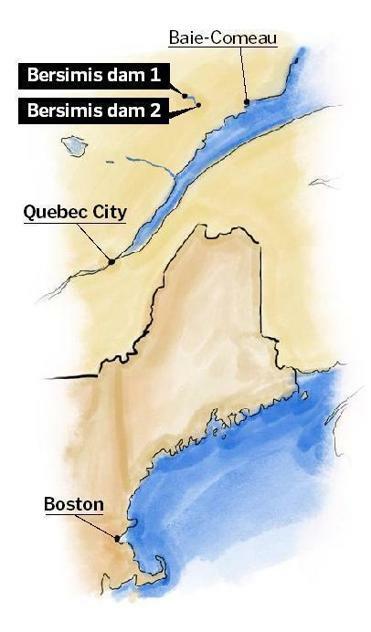 They worry that Hydro-Québec is just trying to placate them until officials in Massachusetts announce their decision. Even more, they worry that the negotiations will end if the company fails to win the contract.